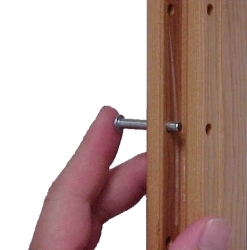 Our shelf pins allow you to adjust your shelf height. You can adjust your shelf height anywhere along the upright in holes set in 1" increments. Simply insert the shelf pin and the shelf end channels will rest on these metal pins. Our pins are solid aluminum and will not rust. These pins are made for Lundia USA product only.